Meet Neo, the next-generation personal assistant! Identifying markets and estimating their sizes is a highly sensitive topic in the startup bubble. If you were to ask 5 founders and VCs on how to approach this topic, you’ll likely get 10 different replies ranging from TAM-SAM-SOM models, bottom-up vs top-down-approaches and “guesstimating” the size. In this article, we’ll discuss various of these approaches looking at the market for digital assistants: What’s its size, and what growth is to be expected? You need three things: formidable founders, a promising market, and (usually) some evidence of success so far. A promising market does not necessarily have to be a gigantic market. Rather, it is about the interplay of (1) potential customers and (2) their willingness to pay, (3) the projected growth in market volume, (4) competitors and alternative solutions, and (5) the barriers to entry for potentially new competitors. Thus, talking about markets quickly evolves to a complex construct – and is therefore often split into (A) competition (i.e. competitors and alternative solutions), (B) market (number of customers and willingness to pay) and (C) “unique selling propositions (competitive advantages a startup may own, that ideally result in higher market entry barriers). With this article, we focus on the centerpiece – potential customers and their willingness to pay – in order to derive the size of our market from them. We use studies, statistics and market forecasts – as you do not have to (and want to!) reinvent the wheel! So, why don’t you get yourself a nice cup of coffee and join us on a tour of the market for digital B2B-assistants. Looking at a fairly generic product – such as our digital assistant Neo – that can potentially be tailored to many industries and sectors makes it challenging to define a market. It is obviously not sufficient to simply multiply the number of companies with an average license fee. That’s why we start by considering the technological environment in which we operate. First of all, it’s about defining and understanding the vocabulary used: For what we define as a ”digital assistant”, there’s already a wide range of terms and definitions out there – most of which have a slightly different meaning and focus. Starting with your market research feels almost like researching keywords, as it is practiced in the field of search engine optimization. Consulting firm Gartner, for example, speaks of “virtual assistants” whereas some consultancies prefix this with “intelligent”. Others, such as the market research firm Tractica, classify them as “virtual digital assistants”. The terms “intelligent personal assistant” and “voice-enabled digital assistants” are also widely use – and we summarize them using the term “digital assistant”. Once terminology has been clarified, you’ll start collecting sources, information and studies – basic research. As a founder, your goal should be to get a rough overview of current market dynamics, key players and structures. A key question and underlying assumption: Is your target market just looking to fill a temporary need, such as Fidget Spinners, or is it about a sustainable trend (such as the apps market, which has been criticized multiple times despite recording new sales peaks year after year). 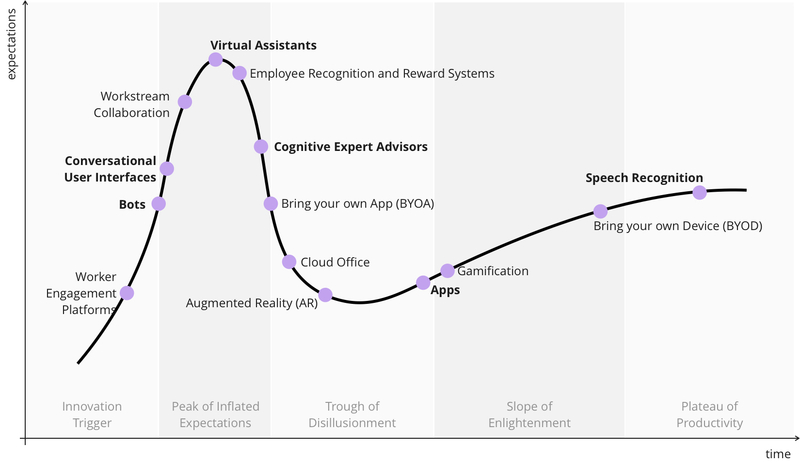 So, we’re at the height of the cycle where expectations for a digital assistant are exorbitantly high, according to Gartner, and will soon move into the “Valley of Disappointment”. This implies that our topic is definitely seen, however, we have to set the expectations accordingly and develop the product with our customers at hand. Which trends play into your hands? Startups always exist within the context of their market and have various dependencies on underlying technologies and trends. Our system is also dependent on many relatively new technologies, such as speech recognition and understanding (where, according to Gartner’s research, a technically stable and operational level has already been achieved). Above all, it is crucial to understand the market for these products or technologies as well – after all, we are virtually a co-provider or even a customer of these solutions. Your solution can be fancy and appealing, but without a factuable market volume, investors and stakeholders will pigeonhole you as “lifestyle-startup without a market”. Fortunately, there are four commonly used approaches to quantify a market size! If there are already direct competitors (and hopefully there will be some! ), a quick research based on their websites, press releases and compulsory publications usually goes a long way. Usually, companies are very eager to share their success stories. Especially larger companies publish regular assessments of the current market situation and growth potential – it’s up to you to take advantage of this data! Your idea is so innovative that competitors have yet to be established? Let’s just assume that you’re correct. However, even under that assumption, the “problem” you want to solve is currently solved using other solutions. Our digital assistant, which combines many systems, would for example include enterprise integration solutions and related IT consulting services. Let’s take workflow-management-tools (WMTs) as reference market: According to a study by the Fraunhofer Institute, more than 10 million user licenses for WMTs are in use at over 40,000 companies worldwide. If we take the average license fee of € 1,000 per year into consideration, we have a current market volume of € 10 billion worldwide – growing rapidly. If you serve an already existing market with existing competition (see # 1), chances are that there’s some research on your market out there. In that case, professional analysts have taken the burden to identify market volumes through expert interviews, statistical surveys and industry reports. There is, for example, a research study by Tractica for Enterprise Digital Assistants. According to them, the current sales volume for digital assistant for enterprise customers totals approximately $ 800 million. By 2025, the market is expected to grow at an annual growth rate of 35 percent to 7.7 billion dollars. The top-down approach is regularly used, as it basically is rather simple. The fundamental principle: From larger to smaller scale. The starting point is a market, whose size is known and already proven – for example, the worldwide revenue generated by software-sales. Using various assumptions and hypotheses based on studies, you can break down the overall market step by step: Market share X is made up of enterprise software solutions. And again, portion Y of X makes up a subcategory – integration solutions, for example. This methodology is especially useful to quickly guesstimate market volume. The accuracy, however, is questionable and fully depends on the assumptions made. Hence, it’s important to communicate your assumptions clearly and upfront. The number tumbling out at the end of your calculations is – to be frank – of secondary importance, as long as it isn’t exorbitantly large (100 billion euros) or unattractively small (2 million euros). Ideally, performing variants # 1- # 5 outlined above lead to similar assessments – as your assumptions, in turn, would be validated by external sources. For a classic “venture capital case”, the market volume should be at least 100 million euros or 1 billion euros – depending on the investor (here is an interesting quora discussion on the “minimum size” issue). Keep in mind that most of them are looking for at least a 10x return on investment, so they need to see this potential justified by your market and product. Your potential investor can logically validate your assumptions and calculations (if you have no miscalculations) and can assess the quality of your sources, which ideally speaks for you. Experienced investors and market experts can then make their own assumptions based on your model and quickly evaluate the feasibility of your calculation for themselves. We want to understand how you think, so explain your thought process and decision making throughout the interview. Remember we’re not only evaluating your technical ability, but also how you approach problems and try to solve them. Explicitly state and check assumptions with your interviewer to ensure they are reasonable. So, we wish you happy brainstorming and lots of fun during the next hours of number crushing to calculate your market size. If you need a sparring partner, just get in touch with us and we’ll be happy to help. If you are eager to demonstrate the way you solve problems and think and look for new opportunities, we look forward to receiving your application for one of our job offerings in the fields of Data Science, Machine Learning and UX Design! Philipp ist Mitgründer und CXO bei Neohelden. Ready to start working in the future? Make your life easier and get started with Neo, your personal AI-assistant. Get your digital assistant and start focussing on the tasks you love.